The United States has a population of 298 million people, using 21 million barrels of oil per day. We only produce 7 million barrels of oil per day. 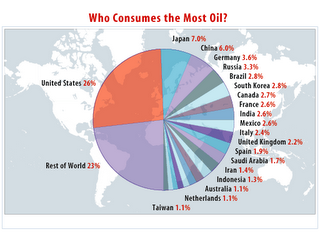 We use more oil than anyone in the world. Behind us is china, at 7 million barrels per day, with a population of 1.3 billion people (a much larger population than the US). 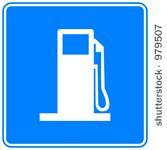 All of Europe, 728 million people, use 15 million barrels per day. The middle east and North Africa is where the most oil comes from per day, with, 36.6 mb per day. Does this bother you a little, or no? The disproportionate amount of oil we waste, compared to what we are producing, on a planet that does'nt have an endless supply? Nigeria, 60% of their population (131 million people) are living below the poverty line, most are surviving on less than one dollar a day. Oil companies have profited from their oil, Shell in particular, and in 2000 the Ijaw people, of Nigeria, took Shell to court, seeking "compensation for environmental degradation". There have been over 4000 oil spills in Nigeria since 1960, yet the Nigerian government has been unable to force envirenmental law, allowing oil companies to use that inability to their advantage. Six years later, Courts decided that Shell had to pay the Ijaw people 1.5 billion dollars, (in part because of an oil spill, in 93-94 that was responsible for an epidemic leading to the deaths of 1400 people). The Nigerian government also blames the oil plunderers for the high cancer rates in the region, Shell refuses to compensate the natives properly, if at all, they want to drag this out further, seeking an appeal. "action against Exxon Mobil would have a negative impact on the US governments ability to fight the war on terror"
Exxon Mobil is funding terror and ,the US government knows it and ignores it. In 2003 this military that is funded in part by oil money, displaced over one hundred thousand people, by implementing Martial Law. 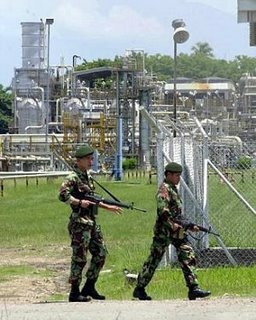 Exxon Mobil, operates on land that belonged to the people, of indonesia and gave them "minimal compensation". 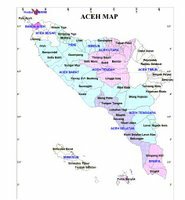 This region is home to one of the largest oil reserves in Indonesia. This military has blood on their hands, the same hands they hold out in front of Exxon Mobil. Exxon Mobil is an American Corporation, and it has the highest value of any other publicly traded company in the world. 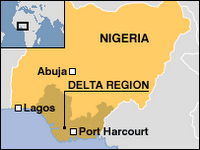 What good is Americas "War on Terror" when America turns its back on the terrorized people of Nigeria, and Indonesia? Terrorized by people directly funded by Exxon Mobil, and Shell. 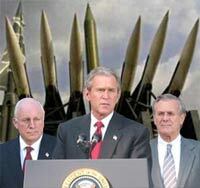 America's "War on Terror" picks and chooses who they deem "horrific" enough to "take on". As long as Exxon Mobil and Shell continue to make record breaking profits, Americans continue their support of Terrorism, by consuming foreign oil (and whole lot of it, at that). This "war on terror" has succeeded only in producing more hate, dismantling governments, leaving behind terrorist breeding grounds. Today gas prices are at three dollars a gallon, and people are starting to care, because it is directly affecting them. It was easy for Americans to buy into the notion, that they "deserve" an SUV, and now that you've got one, oil is hitting 75 dollars a barrel,for no clear reason, and now you call for "easing at the pump". Bushco will answer your calls, and they are going to try to fool you twice.